Includes: bra, two skirts, arm bands, wrist cuffs, headband, half-circle chiffon veil. 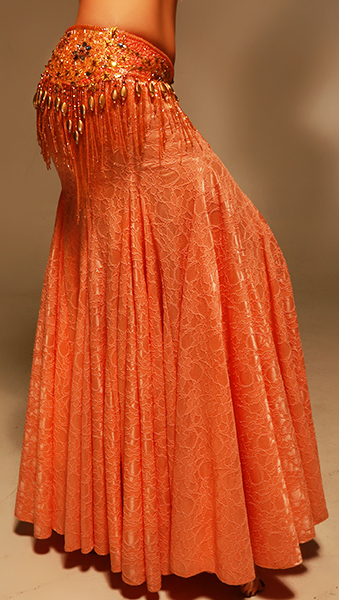 Fabric: salmon lace, salmon satin. Beading: salmon, gold, AB stones. Bra: small C cup. 33" from end to end under bust. Straps attached to the center of the bra. Belt: one piece belt 36" from end to end. 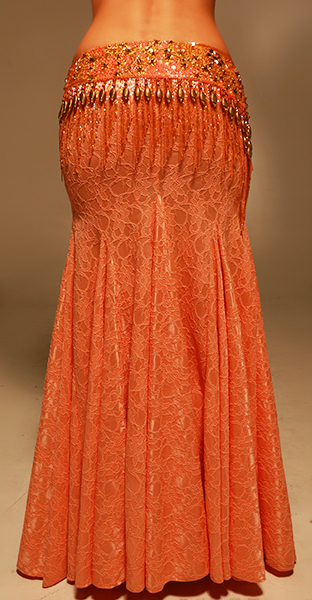 Skirt 1: mermaid lace skirt with fitted upper part and huge flare bottom. Upper hip 30-36", lower hip 36-40", current length: 40". Skirt 2: full satin-like skirt with one slit. Upper hip 30-36", length 39".